Coatings & Anti Corrosion Engineering Review is India’s premier bi-monthly B2B magazine on corrosion management. Subscribing to the magazine gives you access to a wide range of latest information including news products & services, technical articles, events & conferences, company profiles, personality interviews and more. 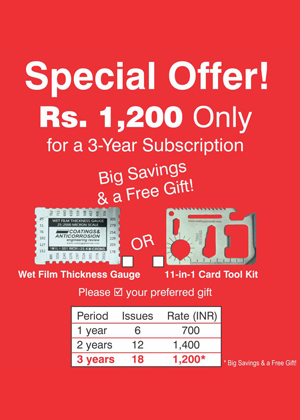 Avail our limited period special offer of a 3-Year Subscription at Rs. 1,200 ONLY! Which of the following best describes your industry / sector / business representation?